Here are pictures of outfits sold by various catalog outlets. Please maximize your screen for better viewing. There were several catalogs that offered clothes for Crissy and her family. While we are on the subject of so-called "catalog exclusives," it would be a good time to clarify that the term "catalog exclusive" does not refer to any and all outfits that were not made by the Ideal Toy Corporation. If an outfit was offered in a catalog, then yes, it is a catalog outfit. If it was not sold in a catalog, and could be purchased at a store such as Grants, Kmart, or Fred Meyer, and it was made by a dolly clothing company, then it is actually an aftermarket outfit. There is a difference. The known catalog houses that sold Crissy and family clothing exclusives are Aldens, Gamble/Aldens, Eatons, JC Penney, Sears (US), Sears-Simpson (Canada), Spiegel, and Wards. All of the known catalog exclusives from these offerings are shown on this and the subsequent site pages. If the collector has a so-called "factory" outfit in their possession that was acquired on a Crissy or Crissy family doll, and it (or a fabric variation of it) isn't shown in any of the catalogs shown on these pages, it is not a catalog exclusive. Please bear in mind that many dolls were sold at the same time as Crissy. The outfit in question may actually belong to another doll. New doll collectors in their zeal to acquire many items in a short period of time sometimes forget this. Many on-line auction sellers, after visiting this site, have come to the conclusion that any factory outfit they have is Ideal issue, catalog exclusive, or aftermarket, forgetting that what they have may actually not be any of these. We hope that all collectors, both new and advanced, will take advantage of the following pictures to get a good idea of what the catalog exclusives look like. Good luck in your quest! 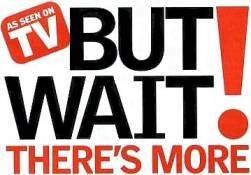 Note: Please refrain from nicking things off of this site for your eBay auctions. We know you'd like to give evidence as to the authenticity of your item, however, it is much preferred that you embed a hyperlink in your auction to this page as many sellers have done (self included). Don't know what that is or how it works? Just email me. Happy to help. Here are some of the outfits for Crissy. Note the fabric variations available for the pantsuit. 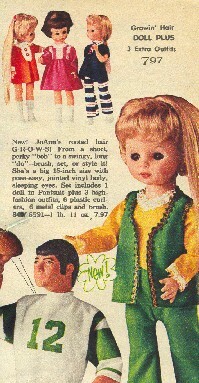 And this lavender housecoat was also sold in the 1971 Wards catalog! Here are some of the 1970 Alden's outfits for Velvet, with a close-up of the blouse that goes under Velvet's poncho. Here is Jo Ann again. This time in the 1971 Aldens book. She was made by Nasco and was sold in many variations, most notably, the one sold in the Wards catalogs. 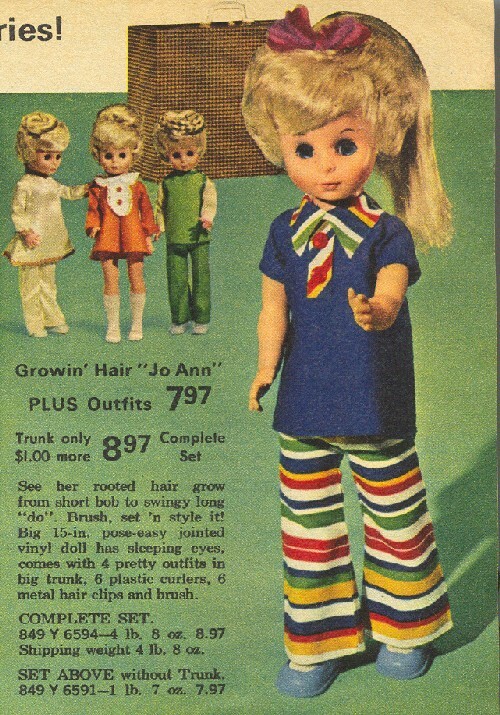 Again, we find ourselves in the 1971 Aldens catalog. One will find Crissy and Velvet clothes. Be aware that there are hundreds of variations due to the use of many different fabrics. Aldens was one catalog that sold sunglasses for Crissy. One could also find them in 1972 Spiegel for Velvet. 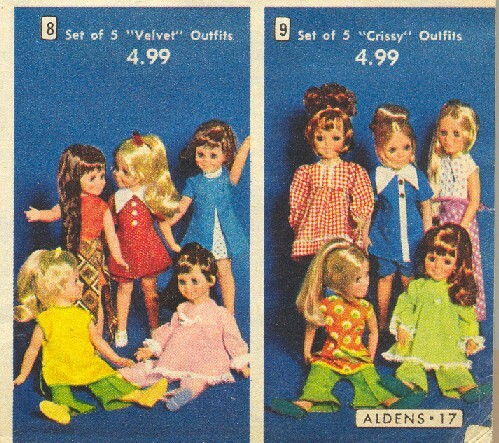 Many of the 1970 Aldens catalog outfits shown above were resold in 1971. 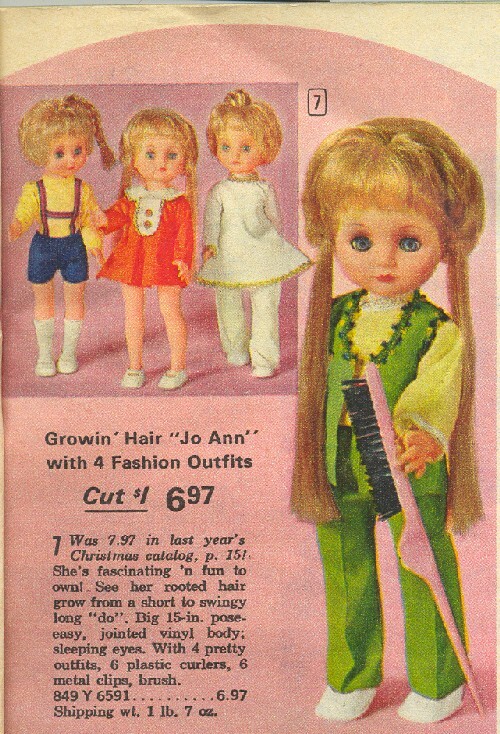 Growin' Hair "Jo Ann" looked a bit different in the 1972 Aldens catalog. Still, she is considered "Crissy competition!" The 1972 Aldens outfits for Crissy and Velvet are very sweet but unfortunately, they don't sell for these prices these days! Here are the sweet outfits that were sold in the 1972 Aldens catalog. Note the color variation in the mint green PJs for Crissy. Also, one pair has a bow at the bodice, while the other sports a little rosette ribbon. The pink polka-dot culotte has a darling coordinating wrap skirt. Tressy is modeling that. The Velvet-sized outfits are equally as precious as Crissy's. The red pin-dot outfit is completed with shorts. The top has a slit in the front that shows off Velvet's belly button. The maxi-skirt in autumn colors covers a short culotte blouse, modeled by Mia. I really love pairing the outfits with vintage barrettes that I purchase in lots on eBay. 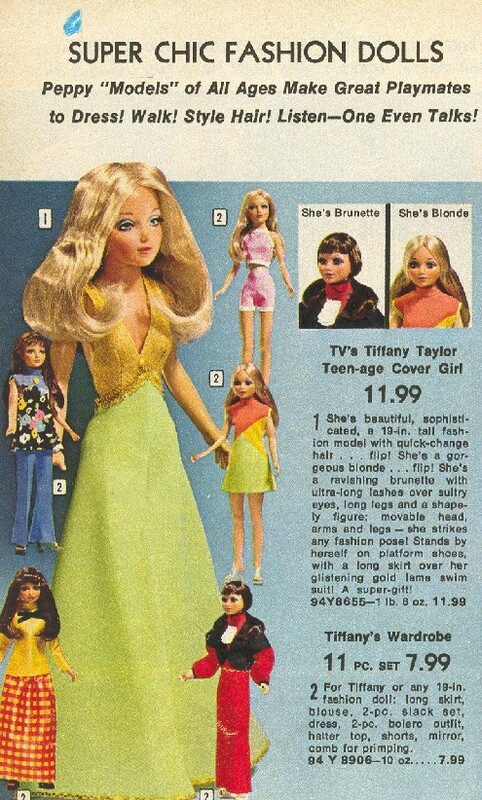 And incidentally, Velvet did not come with a ponytail as long as the doll's on the far right. She has a new 'tail since hers was missing. 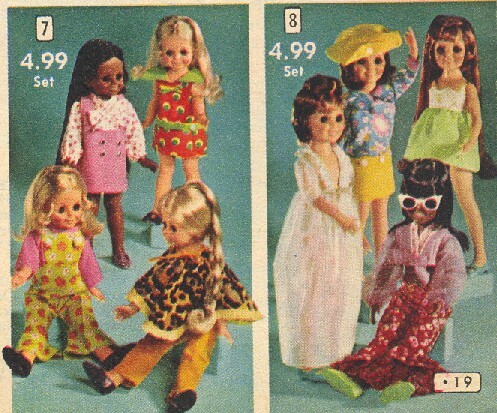 Adorable outfits for the girls in the 1973 edition of the Aldens catalog. This complete set of 1973 Aldens outfits for Crissy is beautiful! The photo features two versions of the PJ set. The pale yellow set isn't often seen. The white print culotte is completed by a double-slit skirt. This innovative design is very cute on Crissy! Here are the 1973 Aldens outfits for Velvet. The pantsuit is shown in white in the catalog, but the blue variation looks stunning with Velvet's coloring and eyes! There is one outfit missing from this set shown in the photo, and that is the orange short-all with the bold floral skirt (as seen on the sitting Velvet doll). Here she is again! This is from the 1973 Aldens catalog. 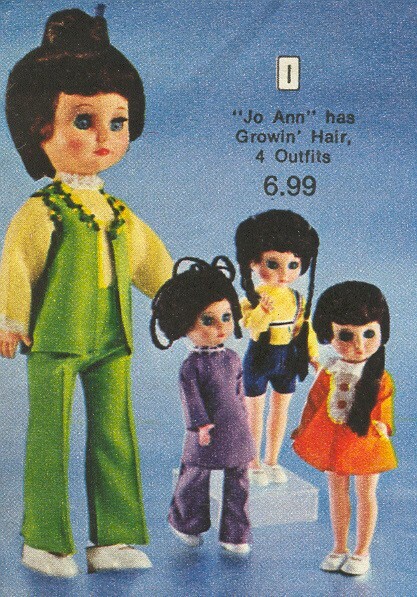 Some think that Jo Ann got odder and odder looking as the years went by. 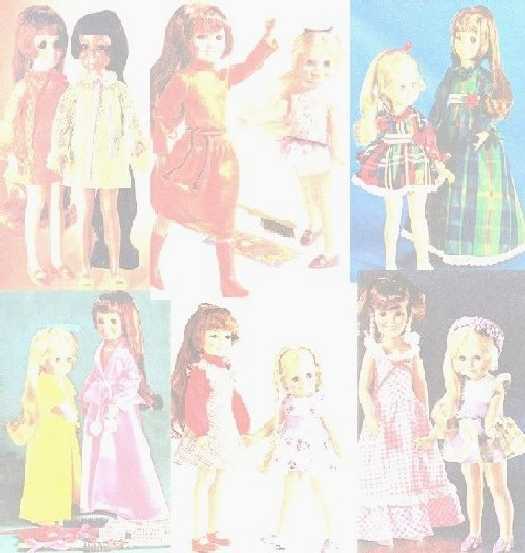 Some of the 1974 Aldens catalog outfits for Crissy may look familiar to collectors of 1970s dolls. Yes, your eyes aren't decieving you. Three of her outfits were made by the same company for Remco's Mimi doll (she sang her song in many different languages I'm sure you'll recall). It was not unusual for the company in Hong Kong that made these doll clothes to sell them to other companies. The red and white striped knit mini was also sold in the 1973 Wards catalog for Crissy. These three outfits were the only outfits Alden's sold for Crissy that were originally made for Remco's Mimi. 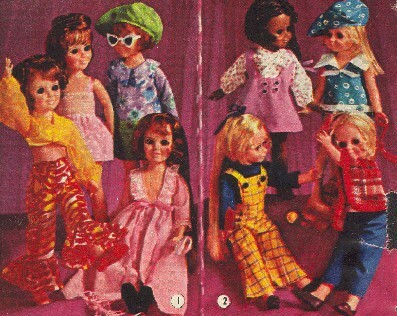 Mimi's issue outfit, in orange and purple and consisting of a mini-skirt, tights, jacket and beret was never offered for the Crissy family of dolls in the Alden's catalogs. You might see it from time to time on them, but remember that it was not uncommon for little ones to dress their dolls with clothes found on other dolls of the time period. Well I just had to show you these outfits for "non-Crissy family" Tiffany Taylor (also by Ideal) that appeared in the 1975 Aldens catalog. There were no outfits for Crissy et al in this book but I'm sure you'll recognize these outfits. There is an aforementioned "Mimi" outfit and also outfits that were originally sold for Crissy in previous Alden's catalogs. No waste there! Click on the links to view other catalog exclusive outfits.